Kandinsky pushed the barriers with his art. Through criticism and rejection, his perseverance paid off to become a master in his field. As he fought off this strong criticism in his early stages as an artist, Kandinsky created various harmonious places for himself and other artists to release their creativity; a safe haven of sorts in abstract art. This included the Neue Künstlervereinigung München (Munich New Artists’ Association) of which Kandinsky was a founding member and became its president in 1909. However, his association with this group was short-lived after the rejection of his painting Last Judgement. This then resulted in the creation of the group The Blue Rider (Der Blaue Reiter) with fellow artists Paul Klee, August Macke, Gabriele Münter, and Alexej von Jawlensky. The Blue Rider group was much less strict and less traditional than the New Artists’ Association. The artistic values of the Blue Rider group were not expressed in a manifesto but it was generally assumed that the common goal was to express spiritual truths through the medium of art, specifically modern art. Their beliefs were founded more on the spiritual side; on a correlation between visual art and music, of a connection between the spiritual and symbolic associations of colour, the synthesis of the arts and a more natural instinctive approach to painting. At a simpler level, Kandinsky’s awareness of this intricate link between these two art forms impelled him to name some of his works of art titles which would typically be reserved for musical pieces. His various composition pieces (Composition, Composition IV etc.) are a direct example of this as well as Musical Overture. Violet Wedge (Study), The Lyrical and Impression III (Concert). This however is just what Kandinsky shares with us about the painting, in turn allowing us to be aware of the impact of music on his art. Without these titles, the correlation might have been much more difficult to establish. This correlation between art and music can also be described as somewhat of a personal experience as Kandinsky himself remarked that “the relationships in art are not necessarily ones of outward form but are founded on inner sympathy of meaning2.” Everything is relative, what one sound or image may bring to mind in one person will not necessarily be the same as for another as they will evoke something quite different for each individual, drawing from each person’s personal experiences, memories and associations. 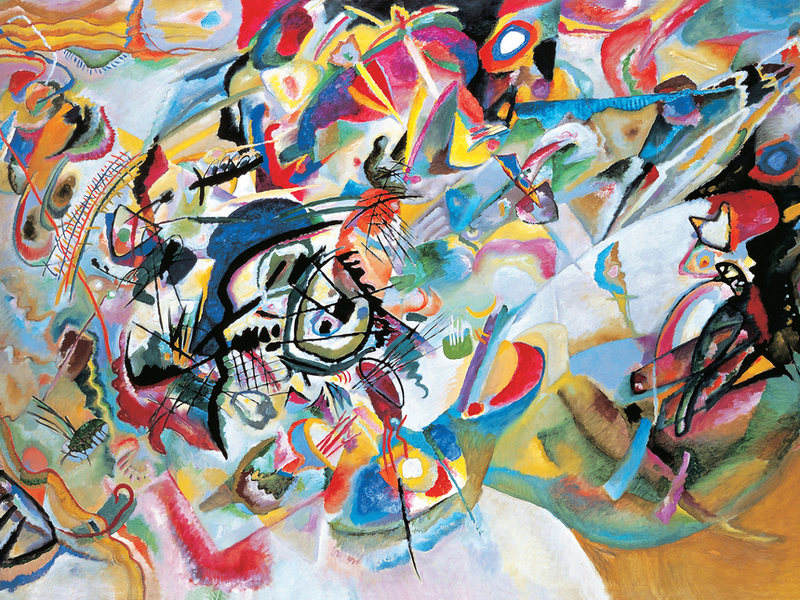 However it may also be noted that “presumably the lines and colours have the same effect as harmony and rhythm in music have on the truly musical.3” Those who have more experience or knowledge of music and art can truly appreciate the subtlety of Kandinsky’s work and the manner in which he combines his external influences, reminiscent of the Blue Rider movement. 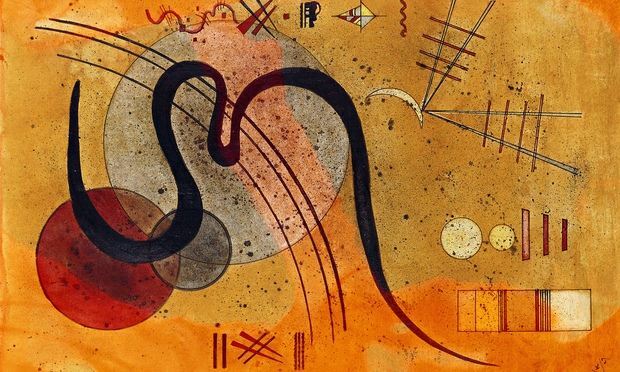 Kandinsky was not only an artist but a theorist; his writings in The Blue Rider Almanac as well as The Art of Spiritual Harmony, also known as On the Spiritual in Art, have brought meaning, value and understanding to his artistic decisions. It is in these writings that he divulges more of the meaning of his paintings, a justification of sorts and specifically refers to music and its effect on his work. Throughout his life, Kandinsky had an “unswerving movement towards a synthesis of the arts”5, making his own artwork an example. In this modern word, a synthesis of the arts has become more and more common and accepted without realisation. In a way, people are surrounded by more art and different art forms than ever before however it is most commonly jumping from screen to screen. Sometimes you may just need to step back, immerse yourself in the simple pleasures of art, and witness the “the effect of music [which] is too subtle for words6” for yourself. A ghostly bird emerges from an envelope and a pair of triangles transform into a dog in “Animated Kandinsky,” an interactive version of Wassily Kandinsky’s vibrant 1932 “Decisive Pink” (“Entscheidendes Rosa”). The mix of gaming features with the geometric shapes is a playful experiment in the subjective interpretation of abstract art. “Animated Kandinsky” is available to try for free on the Itch.io indie game platform. Nivetha Kannan and Sarah Kwan, two students at Carnegie Mellon University, set out to examine the “relationship between traditional abstract art and current animation.” Their interactive version of the 1932 piece (held in the Guggenheim, which prefers “Decisive Rose” as its translation) invites users to click on just about any shape — excluding Kandinsky’s playful signature in the corner — and see it animate with sound, movement, or a figurative interpretation. You can move around the huge pink square that gives the painting its title, or see some repeating moon shapes morph into the face of a sneezing man. For Kandinsky in particular, adding sound makes sense as it was part of his own experience with color. He’s quoted as saying that “the sound of colors is so definite that it would be hard to find anyone who would express bright yellow with bass notes or dark lake with treble.” Similar to animating Old Master paintings or remixing Renaissance art into modern scenes, the animation also makes you reconsider the elements of the painting by putting them in a new context. 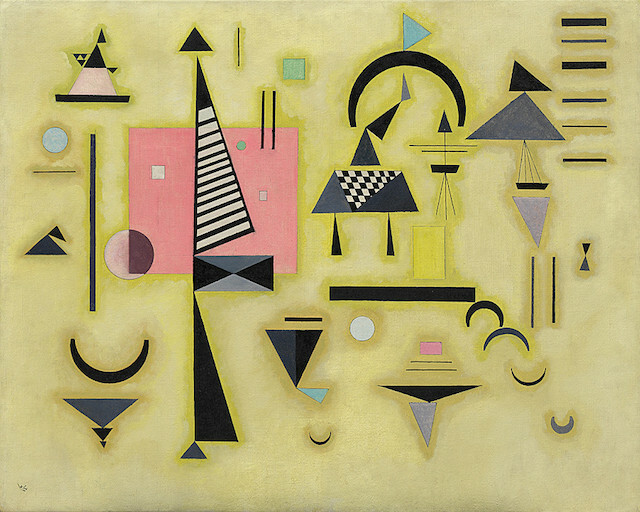 The “Animated Kandinsky,” even with all its bells whistles, is much flatter in its colors than the original oil painting with its gradient of yellow and textured borders around the shapes (it’s also missing some of the finer geometric details). But what it’s lacking in depth it makes up for as an example of how digital interaction can cause you to pause and spend more time with the small pieces of a painting, and appreciate how what at first seems like a random assortment of abstract shapes has a real harmony when you’ve totally wrecked it. Animated Kandinsky is available on Itch.io. The fascinating thing about Wassily Kandinsky is how seriously and carefully he evolved from figurative painting to abstract art. Kandinsky did not become an abstract painter lightly. He reached abstraction in a strenuous, thoughtful way that gives his art huge authority. In his early expressionist paintings villages glow in radiant colours. These landscapes pulse with wild chromatic splendour that resembles the freedom of the fauves. 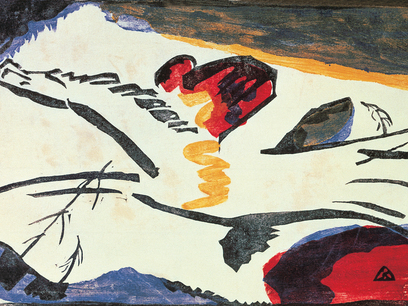 In fact Kandinsky’s expressive landscapes are already partly abstract, in their use of colour. 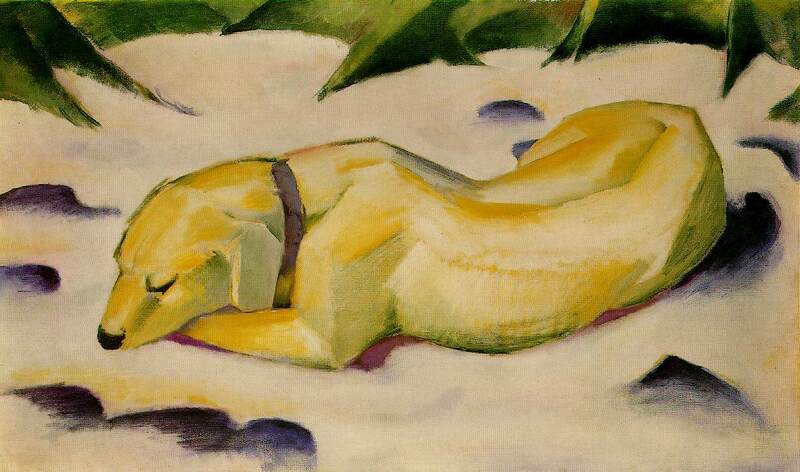 This innovation, that started with the French fauves and was rapidly adopted by the German expressionists, was the first, huge step towards abstraction in 20th-century art. But the wild colours enflaming art in the early years of the century still portray a very recognisable world. Kandinsky took it a revolutionary step further by reaching a logical conclusion – what if painting were pure colour? What if it created its own imaginary world, like the world of a symphony? Kandinsky and Piet Mondrian both build cathedrals of the mind in their abstract art – silent cities of spiritual calm. That mystical impulse is connected to mathematics, and in Kandinsky this means a deep consciousness of structure. If his paintings have the expressive colour of Van Gogh’s Starry Night they also have the classical clarity of Poussin. There is a true grandeur to his concept of painting, and a sense of truth. Whatever we think about his spiritualist beliefs, the result is an art that is at once purely abstract and plainly rooted in a deep feel for the nature of things. A profound, paradoxical and rich achievement. 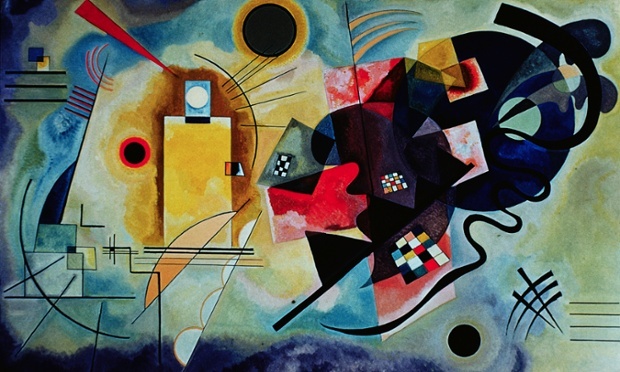 Kandinsky intuits the cosmic complexity of modern physics. His art can be set alongside today’s images of the fabric of the universe. None of this makes Kandinsky an easy artist. It makes him a great one.